Another one dish dinner that is sure to please. Quick to make and serves 4. In a large bowl, mix together soy sauce, cornstarch, ginger, garlic powder, 1/2 tsp sesame oil, and pepper for the marinade. Add beef to the bowl and toss to coat. You can let the beef marinade in the fridge for up to a day if you want. Heat 1 Tbs Sesame Oil in a large high sided skillet or a wok over medium-high heat. Add beef and onion to the pan. Cook until the beef is done. Remove the beef and keep warm. In the same skillet, add additional sesame oil if needed, toss in the broccoli, pea pods, and water chestnuts. 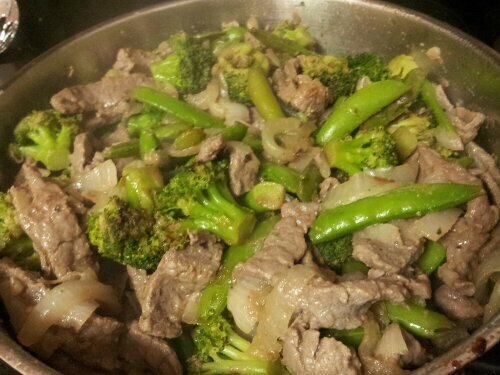 Stir fry until the broccoli is tender yet still firm. Return the beef and onion to the pan. Toss all the ingredients together and heat until all ingredients are nice and hot.